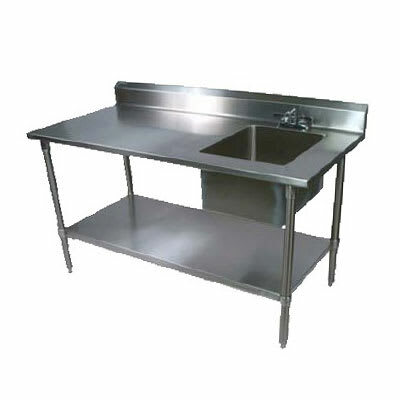 The John Boos EPT6R5-3060GSK-R prep table can be used as a drink station, prep station, or hand washing station. It has a sink bowl on the right side of the unit with a 4-inch, on-center faucet and a 10-inch swing spout. An adjustable undershelf holds small equipment or supplies until they are ready to be used. Uneven surfaces are not an issue with the adjustable bullet feet. Stability is provided by the tubular legs, and a 5-inch riser on the top of the table prevents messes from splashing onto the walls and other equipment. Constructed of heavy-duty stainless steel, this unit is built to withstand regular commercial use. It has an easy-to-clean satin finish for a professional appearance. With its galvanized bottom, the unit is sturdy, and the TIG-welded top adds strength. All of its welded areas have been smoothed for a uniform look. The John Boos EPT6R5-3060GSK-R prep table easily lines up with other tables with its 11⁄2-inch stallion edge and 90 degree bend down. 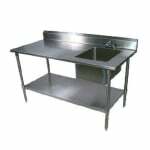 Different types of work tables are available for various uses. We break down major features and benefits of these tables and stands in our work table and equipment stand buyers' guide.